SES Integration specified Clear-Com as the intercom solution for Elevation Church's production facility.Clear-Com has been chosen by AV integrator and supplier, SES Integration of Concord, NC, to be the intercom solution for Elevation Church’s broadcast production facility and church campus in Charlotte, NC. 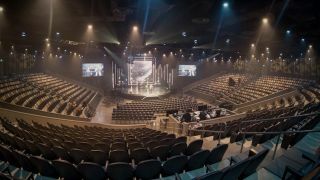 Known as Elevation Ballantyne, the 75,000-square-foot facility produces multiple online video streams that are broadcasted live at Elevation Church’s 15 locations across Canada and the United States, as well as online. In addition to its production facility, Elevation Ballantyne is home to a modern 1,850-seat auditorium with broadcast-quality AV equipment and video cameras. With its suite of Clear-Com intercom products, Elevation Ballantyne can serve a full range of live broadcast requirements across many locations. This includes producing and distributing weekly sermons by church leader Pastor Steven Furtick and his team, plus integrating live feeds from other campuses; including live baptisms over IP. To link production crews within Elevation Ballantyne, plus those at the church’s other sites and on-the-road remote crews, SES Integration selected Clear-Com’s Eclipse HX-Delta digital matrix intercom that has built-in slots for expanding the system. For this facility, SES Integration has loaded the Eclipse HX system with an IVC-32 IP Interface card for connecting to its local and remote production crews using the V-Series user keypanels, Agent-IC mobile app, and LQ IP interfaces with local partyline systems over secure IP networks within Elevation Ballantyne and a number of remote campus locations. Moreover, an E-Que-HX wireless cell controller card within the Eclipse HX integrates FreeSpeak II wireless beltpacks in the 1.9GHz range to the overall intercom system. Two FreeSpeak II transceiver antenna modules were strategically placed to provide full wireless coverage throughout the facility.